AnyFlex is a dbExplorer kind of tool. It allows you to open a database file without the need of having to setup a workspace. Please note that Anyflex was never meant to be used by the end-user! Anyflex uses a dynamic DataDictionary and a dynamic dbGrid. This makes it possible to use filters by using the normal constraints option for DataDictionary. 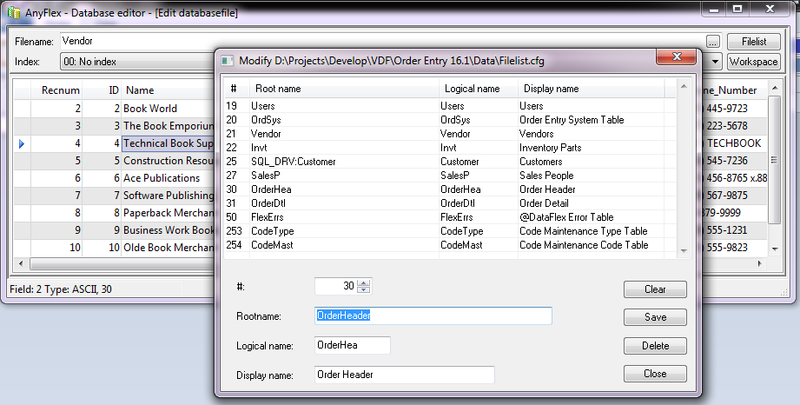 And you will be familiar with standard dataflex keys for editing, deleting and adding records and fields. It is possible to add column modification to the list of functions. But you need to tell the compiler that by defining a constant called "WithColumnProperties". Just comment out or in at the top of AnyflexCfg.pkg code. That give a dialog where it is possible to change a columns properties, add as new column or delete the column. It is per default activated. Download is for either VDF16.1, VDF16.0 or VDF12. I have changed a bit in Sture's vdfquery to correct a minor issue with closing vpe documents. I have changed a bit in Vincent's extended about dialog so username and password from the connection string from an INT file is not shown in the dialog. I have changed a bit in Bob's Global Data Replacement Utility so it can be used as a dialog. The extended dialog uses a bmp file and it should be copied to the runtimes Bitmaps directory. This will prevent an error that states that it cannot find Sysinfo.bmp when opening a file from the windows shell. (normal editing keys as F2 (Save), Shift+F2 (Delete) and so on. F4 - in Text fields gives a modal view for editing the text. F12 - Show/edit post in columns (F2 for save changes). CTRL + S - Choose field from selection list. CTRL + I - Edit indexes. CTRL + R - Reindex all indexes. CTRL + Delete - Zerofile. Delete all records. CTRL + L - Choose the fields to show in the grid. CTRL + K - Copy records from another databasefile to the current databasefile. CTRL + T - Import from variable length or fixed length textfile to the current databasefile. CTRL + N - Open a new instance of Anyflex with the current record found and selected. CTRL + U - Fill current column with a value of your choice. Respects the corrent filter set. ALT + F - Enables and disable the current filter set. CTRL + F - Edit the current filter set. CTRL + D - Count the number of records of the current filter set. CTRL + Q - Clear all filters in the current filter set. Enter - Make a filter from the current value. CTRL + W - Enables and disables full view mode. CTRL + A - Setup a autorefresh timer. CTRL + B - Edit the current filelist entries. CTRL+F1 - Extended about dialog. It is possible to have a deep link from an application to AnyFlex. By that you can assign a hot key (ie. 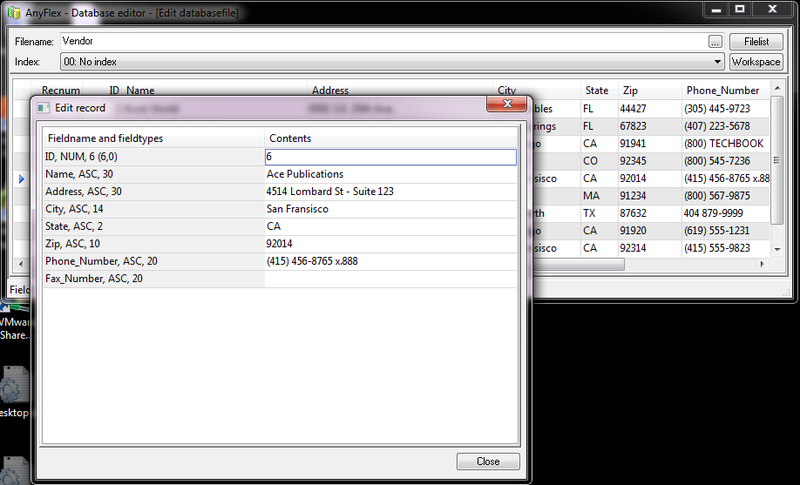 Ctrl + F3) to a deep link procedure, so Anyflex is called with the current record of the Data Entry Object in focus. Below is a sample code of a deep link procedure. What it does is that CTRL+F3 is assigned to the procedure and by calling that, it examines the current object that has the focus to see whether or not it is a Data Entry Object. If it is it get the current data file and current record of the object and calls Anyflex with the information of file and record. This works with both rowid and recnum enabled tables. Just place the code at desktop level. In the Studio that could be in the Outer-Component code section of your application (after the green line). // Is deeplink allowed? You could get the full path to anyflex.exe from the registry database. // Otherwise just enter the the full path + anyflex.exe here. Send ignore_error to error_info_object 98   // Forms on dialogs causes this error.